In New Zealand there are some 56,000 kilometres of paper roads – streets and towns that exist only on surveyors’ maps. Or do they? A young woman from Central Otago strays from the beaten track and finds herself in a paper world. It seems a land of possibility, but she soon discovers that things that happen in the fictional world can have frighteningly real consequences. From Trick of the Light Theatre (The Bookbinder) comes an award-winning production drawn from the twitchy edges of children’s literature – a dark fable reminiscent of Neil Gaiman, and of Pan’s Labyrinth. 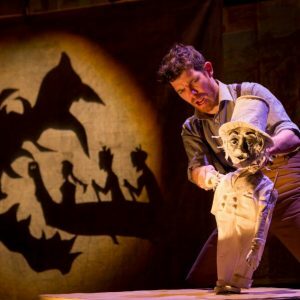 Combining puppetry, shadow play, and live music, The Road That Wasn’t There is a captivating cross-over work for adults and older children. WINNER of Outstanding new NZ Play, Most Promising New Director and Production of the Year at the Chapman Tripp Theatre Awards. WINNER of Best Children’s Event at Fringe World (Perth) and Adelaide Fringe.